The fast growth in online transactions for goods is a testament to consumers’ desire to bypass travel frictions. 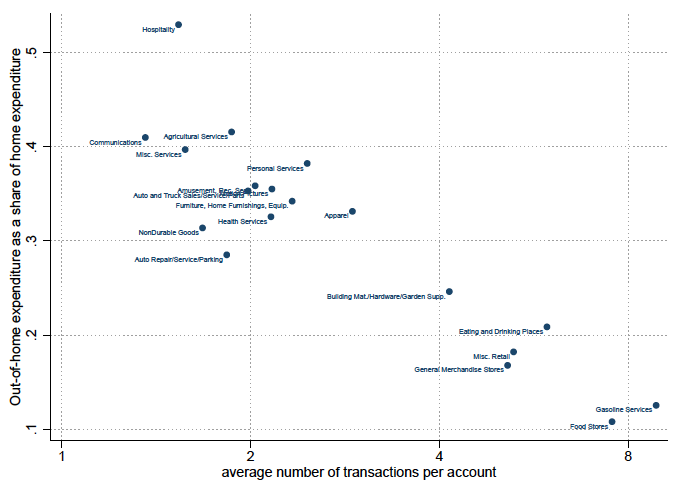 Still, e-commerce transactions represented less than 7% of total retail sales in 2014 (Hortaçsu and Syverson 2015). For many goods and services, the willingness of consumers to travel for their purchases is central to the decisions of firms about where to locate and what to sell – from apparel stores to restaurants, industries involved in the delivery of final consumption goods account for almost 40% of employment in modern economies. A deeper understanding of consumer mobility is then potentially consequential for a broad range of policy-relevant questions, including the impact of investment in transportation infrastructure, of trade in services – whereby foreign establishments locate at home – and of other ‘place-based’ policies (Kline and Moretti 2014) in general. In a recent paper, we use evidence from around 1.7 million credit card transactions to provide the first cross-sectoral description of local consumption markets, and argue that consumer mobility appears to influence local employment, establishment density, and establishment size differentially across sectors (Agarwal et al. 2018). 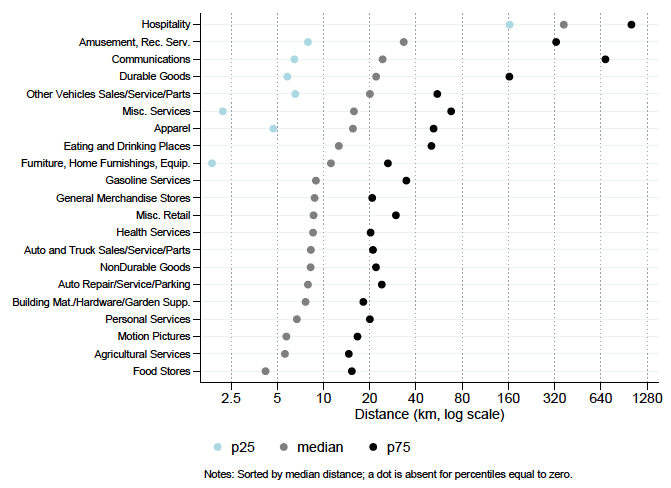 The limited willingness of consumers to travel is apparent in Figure 1, which shows the distribution of distances travelled by consumers across different sectors. The median transaction in the data occurs at about 9 km from home, and there is large heterogeneity in observed trips both within and across sectors. The patterns make sense overall – the median transaction occurs at 4km for staple items like food stores, and around 12km for eating and drinking places; it is, however, above 20km for durable goods and 33km for amusement and recreational services, which are likely purchased less frequently. Comparing out-of-home expenditure at different distances, as is typical in standard gravity regressions, we find declines that are milder than other phenomena affected by spatial frictions – for the median sector, a 1% increase in distance decreases total expenditure by 0.4%, an elasticity substantially smaller than firm-to-firm intranational trade (-1.3%, see Hillberry and Hummels 2007) or commuting flows (-4.4%, see Monte et al. 2018). The reason is that most of the decline occurs at very short distances – for the median sector, the expenditure in the average out-of-home location is only 34% of the expenditure in the home location. Across sectors, expenditure drops faster in space for sectors that are on average purchased more frequently. This relation, reported in Figure 2, makes economic sense – when goods are less storable/durable, consumers will want to buy smaller batches per trip, and buy more frequently; since travel is expensive, however, they will also buy closer to home. We imagine storability/durability as a broad notion – strawberries experience physical depreciation; for services, like haircuts, the utility flow of the individual purchase ‘depreciates’ over time (in our example, as hair grow back). When we explore individual behaviour, we find that higher-income individuals choose to travel shorter distances for the same sector, controlling for other individual and local characteristics. We also reconstruct local weather conditions on the day of the transactions, and compare the behaviour of the same individual under two potentially different travel-cost regimes induced by rainfall. We find that rain affects the spatial distribution of transactions relatively less in sectors where the average frequency of transactions is higher – since the supply network is fixed in the two travel cost regimes, the difference is likely to come from an active choice of consumers, either via intertemporal substitution of trips, or via a choice of where to travel. These pieces of evidence show that consumers make active choices about how far to travel. The negative relation between gravity and frequency is not exclusively driven by supply side considerations, like less dense apparel stores that could force people to travel father, and hence less frequently, for their purchases. Do firms in different sectors make their production decisions accounting for consumers’ willingness to travel? In a simple spatial equilibrium model, if firms produce using labour and ‘land’, a larger local demand will require more employment but also the rental of land plots which are farther from consumers. However, distance is overall more ‘expensive’ for goods and services that depreciate quickly – for those sectors people buy larger batches, more frequently, but closer to home. Hence, one would expect firms to try to be relatively closer to consumers for strawberries than for haircuts, and substitute land with labour (i.e. increase employment density) at a faster rate for strawberries. We examine this intuition comparing relative sectoral employment in US counties that differ in population size. We use the underlying geological composition of a county as an instrument to circumvent the endogeneity problem arising from regressing county-sector outcomes on population within the county (Duranton and Turner 2017), and proxy storage costs with the average observed frequency of transactions in our credit card data. We find that in sectors which are purchased more frequently at the national level (i.e. where storage costs are presumably higher), local employment grows faster in response to (exogenous) differences in population. Further, the differential growth in employment is driven by the addition of establishments at a faster rate (i.e. increase in density), rather than by larger employment per establishment. These findings are consistent with a more geographically concentrated demand arising from the need to save on travel time, and supply responding with a relative reduction in the average distance between consumers and stores. Our results are reminiscent of intuitions that can be traced back to Von Thunen's model of rural land use – more perishable items like dairy should be produced right at the outskirts of the village. Our results can also be related to the classic proximity-concentration tradeoff in foreign direct investment (FDI) (e.g. Horstmann and Markusen 1992, Brainard 1997). In those theories, firms choose whether to serve a foreign market via exports or the opening of a new establishment. We cast a parallel whereby firms in a city can choose whether to serve customers in a neighbouring city by expecting them to travel (‘export’) or opening a new establishment close to them (‘FDI’) – in sectors with high storage costs, demand is more localised and the ‘FDI’ option becomes more attractive. Since we attempt to apply a unified logic to consumption markets that are potentially quite different, our results are obviously subject to a number of caveats. On the other hand, they suggest that consumer mobility may be relevant both at the individual level and in the formation of local equilibrium outcomes. We hope our work will stimulate further research in what appears to be an important and under-studied dimension of economic activity. Agarwal, S, J B Jensen and F Monte (2018), “The geography of consumption”, Georgetown University, mimeo. Brainard, S L (1997), "An empirical assessment of the proximity-concentration trade-off between multinational sales and trade", American Economic Review 87(4): 520–544. Duranton, G and M A Turner (2017), "Urban form and driving: Evidence from US cities", Working Paper. Hortaçsu, A and C Syverson (2015), "The ongoing evolution of US retail: A format tug-of-war", I2 9(4): 89–112. Kline, P and E Moretti (2014), "People, places, and public policy: Some simple welfare economics of local economic development programs", Annual Review of Economics 6: 629–662. Hillberry, R and D Hummels (2007), "Trade responses to geographic frictions: A decomposition using micro-data", European Economic Review 52(3): 527–550. Horstmann, I and J R Markusen (1992), "Endogenous market structures in international trade", Journal of International Economics 32(1-2): 109–129. Monte, F, S Redding and E Rossi-Hansberg (2018), "Commuting, migration, and local employment elasticities", American Economic Review, forthcoming.